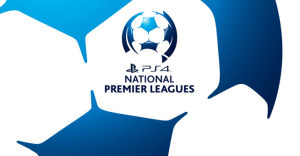 Edgeworth coach Damian Zane praised the determination of his side after they defeated Lambton Jaffas 2-1 to strengthen their hold on top spot in the Northern NSW PlayStation® 4 National Premier Leagues (PS4 NPL). The Eagles extended their ladder lead from two to three points and effectively knocked the in-form Jaffas from second to fourth with a hard-fought win featuring three cracking goals. Defender-turned-attacker Ayden Brice put Edgeworth ahead with a well-struck volley on the 14-minute mark. The Jaffas hit back when Alex Palozzi curled a freekick into the top-left corner of goals in the 28th minute. Edgeworth took back the lead when Dylan Holz made the most of a turnover in Jaffas territory in the 42nd minute, showing his speed to get behind the Lambton defence before producing a well-placed finish. The Eagles then dominated the second half as the Jaffas struggled to recover from the loss of defenders Kevin Davison (back) and Grant Brown (shin) to injury. Zane was proud of how his side responded to the 2-0 loss to Adamstown in Round 14 and his call for the them to compete physically with the Jaffas. ‘‘The Jaffas have some pretty experienced and strong players in their squad and I did ask my players to match it with them,’’ Zane said. ‘‘It’s not our game really, but it’s one of their strengths so we had to at least match them in that area and we did. Jaffas coach David Tanchevski was disappointed with the second-half effort from his side. ‘‘I thought we knocked the ball around well for the first 15 minutes but it just then turned into challenges flying left, right and centre,’’ Tanchevski said. ‘‘They tried to break up our fluidity of play with lots of fouls. It was a pretty ugly game. There were some good finishes, but that was about it. Adamstown coach Graham Law was pleased after his side came through another 2-0 win unscathed but believes their finals chances are all but gone. After beating Edgeworth 2-0, sixth-placed Rosebud secured the same result against Maitland to move to 22 points – six points behind the top four with three rounds remaining. Former Newcastle Jet Travis Cooper scored from a Nic Bale pass in the 25th minute and the pair reversed roles in the 31st minute to give the visitors their second. Law was happy with the performance from his side and said they controlled the game throughout. However, Law said results in other games had gone against his side and they were unlikely to make the top four with games against Lambton Jaffas, South Cardiff and Newcastle Jets Youth remaining. ‘‘I think Joel Wood got in behind us once and hit the side-netting but other than that, I can’t remember another shot they had at goal,’’ Law said. ‘‘For us now it’s about getting the win, getting through the game with no injuries and suspensions, and moving on to next week. ‘‘But I look at what’s left, and I think the games are going to run out for us. The loss and South Cardiff’s win over Broadmeadow left Maitland (11 points) just two points clear of last place and set up a huge clash with Charlestown (12 points) this week. Magpies coach Reece Thompson said his side ‘‘played terrible’’ and there were no excuses for the performance against Adamstown. ‘‘We were flat for a pretty big game you would expect us to do pretty well in,’’ Thompson said. Weston coach Trevor Morris was relieved to walk away with three points on a ‘‘tough day at the office’’ against Charlestown in windy conditions. The Bears won via a header from Liam Thornton midway through the first half and a stern defensive effort in the second half. Thornton had a header saved from a set-piece before Robbie Turnbull crossed the rebound back to him for the goal. The victory moved Weston from fourth to third place on 29 points, one behind Hamilton and one clear of Lambton Jaffas. Morris was happy with the effort from his side after a 0-0 draw with Maitland last week but hopes for an improved attacking performance in the closing rounds. ‘‘It was the same as last week, our final ball in the front third was pretty disappointing,’’ Morris said. ‘‘But it was a scrappy game. I thought we defended well and fought really hard to preserve the lead. Charlestown coach Shane Pryce said his eighth-placed side, who sit three points above last-placed South Cardiff, failed to take their limited chance and the Bears deserved the win. ‘‘They were very structured and organised and took their chance,” Pryce said. ‘‘We were very flat in the first half and they dominated. We pressed for a win in the second half by putting a bit more pressure on using the wind, but they still had control of the game. Charlestown next face a crucial game against Maitland on Sunday before a catch-up match against the Newcastle Jets Youth on Wednesday, August 5. Two goals from Korean Jeong Sang-deok and an injury-time sealer from midfielder Matt Darr converted a dominant display from South Cardiff into three valuable points against Magic. The Gunners moved to nine points, just two points behind second-last Maitland, with their second win of the season. After a gutsy 3-3 draw with Hamilton, South Cardiff produced their best performance of the year to date. Jeong was off target early but found the back of the net in the 43rd minute when he took a lobbed pass near halfway before breaking away then chipping advancing Broadmeadow keeper Nathan Archbold. After a flat first half, Broadmeadow came out with more energy for the second half and equalised in the 54th minute when Kale Bradbery held up the ball in front of goal before hitting a strike on the turn. Their joy, though, was shortlived as Jeong struck a high volley home in the 64th minute to put the Gunners 2-1 up. Darr was on the spot in the 91st minute to guarantee the win, powering a shot into the back of the net after sustained pressure from the Gunners. South Cardiff captain Dan Johnson said he was ‘‘pretty happy with the boys and pretty proud’’ of the effort in the crunch game. Johnson was also pleased for Jeong, who has been a constant threat in front of goals this season without regularly producing the finishing touch. ‘‘He’s probably been down on confidence in front of goals, but he does so well holding up the ball for us using his body,’’ Johnson said. Magic slipped to five points outside the top four with the loss and now face an uphill battle to make the play-offs. Co-coach Rob Virgili described the performance as ‘‘embarrassing’’ and offered no excuses for the loss despite injuries to Max Markey (knee), Daniel Casciaroli and Luke Virgili (both ankle) during the match. ‘‘We came out stronger after half-time then got that goal, but when they scored that second one, you could see the boys’ heads drop and then the injuries came,’’ Virgili said. The wounded Broadmeadow line-up now face a tough task to bounce back for their Westfield FFA Cup Round of 32 game against Victorian PS4 NPL side Heidelberg United on Wednesday night at Magic Park. Hamilton jumpstarted their title hopes with a 7-0 thrashing of the Newcastle Jets Youth to move into second place with the best goal difference in the league. Hamilton led 4-0 at half-time and were never threatened as Kane Goodchild and Simon Mooney scored two goals each and Jacob Bailey, Jason Korotkich and Ben Koina finished with one apiece. The victory ended a frustrating run for Olympic, who were unbeaten leaders before having three draws and a loss in the previous four rounds. Mick Bolch’s team now sit three points behind leaders Edgeworth with games against Weston, Charlestown and Maitland to go. ‘‘We just had that bit of luck,’’ Bolch said after the match. ‘‘We could have scored five goals a game the last few weeks but we just couldn’t score. The result came despite Olympic losing Mason Campbell in the warm-up with a hamstring strain and Tom Davies to a broken toe last week. Jets Head of Performance Mark Jones was filling in for Peter McGuinness as Newcastle Youth coach and he was disappointed with the effort from his team, which included A-League players Braedyn Crowley and Michael Kantarovski, as well as the likes of Tom Whiteside and Reece Papas. Jones said the Jets ‘‘didn’t man up defensively or put their bodies on the line’’. ‘‘They just weren’t up to the task today,’’ Jones said after the game. ‘‘Defensively we were weak and we just didn’t aim up. ‘‘It was one of those games where that many things went wrong. It don’t know how to explain it. Jones said Antonee Burke played well and worked hard as a No.10 ‘‘but he was pretty much on his own’’.